Our in house tool design and manufacturing facility enable us to react quickly to your needs for new and modification of existing tooling. 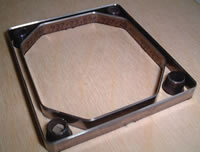 Laser cut tooling boards, cut directly from your dxf or dwg files can be produced very accurately and very quickly. This profile offers similar advantages to Long Centre Bevel, When converting thick materials. The additional advantage is the material being converted is left with a 'square' cut edge, distortion is left on the the material waste. A Useful profile for cutting rigid materials and closed shapes. The minimum counter bevel leaves a 'Square' cut edge on converted material. Useful for the conversion of thick or hard materials. This bevel reduces the amount of material deformation during conversion, also reduces the cutting force required. A steel rule die consists of a hardwood base with sharpened steel blades, or rule inserted and connected in a pattern. Different techniques of assembling the punches, blades, ejection and other die components may be used to accommodate the various characteristics required for each part. Designs which take into consideration the strengths and weaknesses of this die system produce failure free parts economically. Steal rule serves two functions; to cut material completely through or to score the material for folding. Centre and side bevel rule is used for full or partial cutting. Creasing rule is used to provide a score line without cutting material. The perforating rule is used for “perf” scoring, which is preferred in certain applications. Die construction details are usually specified by the die maker and the part fabricator. Multiple cavity dies are available for higher volume production. Multiple layers or birch provide a tough, shock absorbent, warp resistant base. Grooves cut into the base. Grooves cut into the base accept steel rule which is either straight length or hand-bent. Self adhesive rubber strips are placed close to rule to help remove finished part from the die. Solid rubber ejection is available to cover the entire cavity, if required. Formed by bending a single rule; radius can vary. Inserted into base to form internal cutouts. Available in standard shapes and sizes (round square or oval) and custom shapes and sizes. Set slightly lower than cutting rule. Used to score or crease material for folding. Different heights, thicknesses and edge treatments provide all linear cutting and scoring/creasing. Rule used to completely cut out any part of the material are set to one height. Die cut parts have four basic elements: blanks, scores, holes and tabs. These features can usually be formed simultaneously. Optimal part design for die cutting involves a balance between specific features and manufacturing economies. Blanks are formed by a full depth rule cut which separates the part (blank) from the remaining stock. 1. Avoid sharp interval/external corners which promote cracking or splitting of material. 2. Round external corners increase die strength and service life. Additional benefits include faster production, prevention of cracks, corner splits and burrs. 3. Minimum radius should be 0.031" for material less than 0.031"thick. Scores are formed by cutting or creasing the blank. This establishes a line along which the part can be easily and accurately folded. are a partial depth cut. Depth should be controlled; deep cuts cause material to tear, and shallow cuts result in inaccurate folding. do not cut but "upset" or thin the material. Consequently, depth is not as critical as with cut scores. A Series of holes must be kept at a minimum distance from a score line to prevent the part from folding through the holes. Four material thicknesses is the recommended minimum. Holes can be produces in the blank in virtually any shape through the use of standard and special punches and rule formed of the desired shape. 1. Standard size round punches increase in diameter by 0.015" increments. Use standard punches when possible. Standard square punches are also available. 2. Use at least two material thicknesses between adjacent holes. 3. Use an oblong hole to replace a series of holes where possible. 4. Avoid placing holes on score line. 5. Locate a hole at least two material thicknesses from the edge in order to avoid tearing or bulging during fabrication and handling. Note alternative methods. 6. Odd shapes can be made by bending a steel rule to the desired shape. Minimum specified radius should be 0.031". 7. Avoid sharp internal corners which promote material cracking and splitting. 8. Slugs can be left on if necessary. Indicate to fabricator if slugs are to remain or if part is to be "clean". Some punches, predominately the self-ejecting type have larger diameter bases than the holes they produce. Part design may include tabs for various reasons. Often they are to accommodate an attachment feature. Internal tabs are completely enclosed within the part; external tabs are located along an outside edge. 1. When putting holes in tabs, provide a minimum of two material thicknesses around the holes. 2. Provide a slot completely around the tab, if possible. 3. Tab cuts should not be terminated with bare rule end. The resulting stress riser can cause cracking or tearing. 4. Internal tabs should be terminated with holes to dissipate stress.